Still working on PB challenge but I obviously have no time to blog. Seriously, I have not even been to MDA in at least a week. Life needs to settle down. Well actually, I like being this busy and it is just that writing any thoughts down outside of my daily plans is just too much. OK, Obviously I started one day after the official launch since I did not go to MDA until 9 PM on Monday. For me that is sugar and grains. My tendency to seek out that which is detrimental to my desires is kicking in and pointing me towards eating some crappy sweet junk. On a non-challenge day I would find a way to justify doing just that but I am determined to make it through today with minimal, no, without shooting myself in the foot. Day 1 review, it was a successful day. Well, mostly. 2 cups Bulletproof Coffee , well, sans the MCT oil this morning. part of tossed salad, dry. 1 tsp of raw, local honey at bedtime. OK, this is where I was not so successful. With the "play" happening from 9:30pm to 10:30pm that means that we did not get home from the rink until after 11pm. Then showers mean not hitting the bed until after 11:30, feeling wired with no hope of falling to sleep for a long while. With the alarm set for 4:45 which would have us getting to work late (but we have late meetings this afternoon so we will be at work late anyway) that means way to little sleep. I also did not make it out into the sunlight at all. I hope to improve this segment of "way" in the coming days. 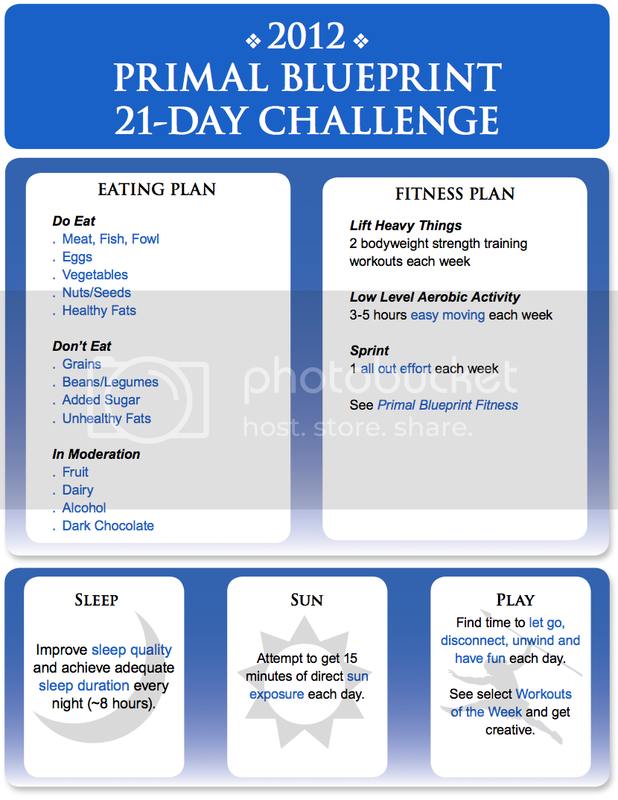 2012 Primal Blueprint 21-day Challenge! Today's focus for me: Law 1: Eat lots of Plants and Animals.